Wonderful melodic trio with uncommon instrumentation: electric bass, saxophone/clarinet, drums. 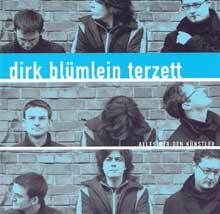 With this band,Stuttgart-based Bassplayer Dirk Blümlein has found a way to present his idea of how a small ensemble should sound. music in between jazz und pop, originals of every band member, one adepted standard and a film score are presented on this CD. outstanding musical compagnions are Andreas Francke (as, clar) and Eckhard Stromer(dr). Having played together over the years in different bands pays off with exceptional musical understanding and harmony. All this makes for a great CD.